Show and Tell! 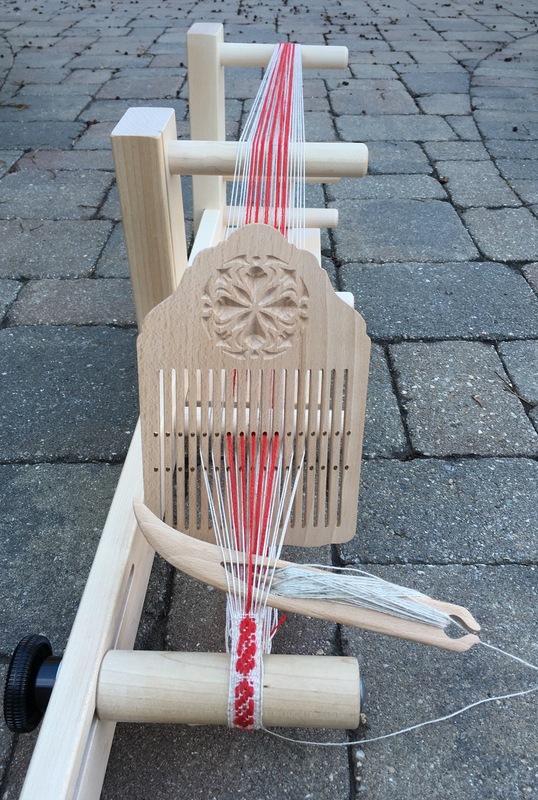 I wanted to share a photo of my new beech 2 hole rigid pattern heddle and Saami pick up shuttle. They were made by Mila M. in Warsaw, Poland. I purchased them from Mila's Esty shop, FolkTalesPl. I love the carved pattern on the pattern heddle. It was easy to warp and most importantly, it fits well on my Schacht Inkle loom. Pattern heddles are usually used for back-strap weaving, the width of the heddle isn't an issue. As a result, most pattern heddles are too wide to use on my inkle loom. This one is perfect! The Saami pick up shuttle makes selecting the pattern threads very easy. I really enjoy using them now and know that they will be even nicer as they acquire patina with use. PS: Mila carves wooden cookie molds too! Springerle cookies are one of our families favorite Christmas cookies.